I saw a special on the television about Westerns and aging gracefully last night. The narattor interviewed stars from the old Western cowboy shows. They shared their memories and experiences during their shows. As a young girl, I grew up watching these brave, daring, rescuers of every maiden, settler, or family member with their wisdom or “daring do.” Western/Cowboy shows like Rawhide, Wagon Train, Rifleman, The Virginian, Bonanza, Maverick and so many more thrilled me as a kid. So I was totally happy to see pieces from those very shows. Seeing the actors and actresses as they were in those old days was so wonderful: tall, handsome or beautiful, wise in the ways of handling bad guys. Or for the female actresses being beautiful (or as with Barbara Stanwick on Big Valley) matronly, beautiful and tough, able to adapt to the “man’s world” of the West! The narrators spoke of how these shows addressed such problems as racism and even laid the groundwork to interracial understanding. Rosie Greer, famous African-American football player, played a freed slave; Ed Amos, played Mingo, Daniel Boone’s Native American partner; and Henry Darrow was an Hispanic actor. We saw people of races we really didn’t know very well back then. By the end of each show everybody stayed young and got along after learning a lesson from the star. These shows also helped us address some of our own problems. All of the shows dealt with some drama, tragedy, love interest, comedy, adventure, challenge, wound or disease they had to deal with. Many episodes showed us father-son relationships such as the one between Ben Cartwright and his sons on Bonanza. There were a few deaths of good characters but these were quickly forgotten in the next episode. James Arness, as Matt Dillon, avoided shooting the bad guy when possible, teaching us to save the killing or wounding as a last resort and try to talk to the bad guys first, or outsmart them. As young people, we learned much from these fictitious characters about dealing with life. Then there was John Wayne, well, need I say more? I also learned a lesson from watching some of these aged actors as they spoke fondly of their characters and shows. I had just seen clips from their shows, made fifty or more years ago, when they were young and handsome or beautiful. Now they were aged, wrinkled, elderly or in poor health. They had grown old. Most of these aging actors I recognized; a few I would never have known who they were. Where had the handsome/beautiful stars gone?. Their faces and bodies had changed from the ravages of time, stress, weight gain and whatever else happens as we age. I wanted to remember them the way they were! We will all get wrinkles! We will all gain some weight! We will all look older as we get older. (No matter how long we fight it!!) No matter how much makeup, hair coloring, exercise, or whatever, we will get old someday, (hopefully)! Sure we would all like to maintain our youthful glow or strength but we will eventually change. There are several alternatives: we can exercise our butts off, trying to maintain that girlish/manly figure; we can hide wrinkles with excessive make up and color our hair to our youthful colors, or wear a toupee, or deny it and fight it tooth and nail. Some people age well and look great at eighty, some do not. Or we can accept that the aging process is part of life and let it happen as healthily as we can. The truth is, when we are eighty, hopefully we won’t be worried about how beautiful or handsome we are? (I am not saying to let ourselves get run down or look like a hermit!) We will have something much more important to offer the world than temporary external beauty. We will have a lifetime full of experience and wisdom that we can share with whomever chooses to listen. We will hopefully have learned how to love ourselves better, (having finished with our teenage angst), learned to deal with problems (having survived the newness of being a newlywed), and learned how to handle stress (after making a marriage work and raising children and paying the big bills). Our lives are our own show, on which others will look back and think of us as we were when we were young, but hopefully they will also think back on us the way we were when we were older. Hopefully, we gave them an example of wisdom, love, patience, integrity, hard work, perseverance, kindness, generosity, forgiveness, joy and thankfulness. Hopefully our lives will be viewed and loved by our children and grandchildren, and great-grandchildren but in a more real and wonderful way than my cowboy heroes were viewed by me as a little kid. We hopefully will attain a degree of peace in our lives. That peace transcends all the physical changes we will experience. Maybe we can be an example to our children and grandchildren to show them what is really important in life. The love of our family, friends, neighbors, country and our God are what is truly important. Those are what we need to show and share with those we love and know. Therein lies the good things about aging. We can help others to know and learn and enjoy this life and repeat the cycle in a healthier and wiser way as they become our age. Thank you, Sqwarl!! That means alot coming from you!! You are so talented in proofing, art, creating and so witty too! Janet, you are a sweet friend. I really appreciate you!! Hugs! Thank you, Ksbeth! It is one of my favorite articles. I hope it will help others to deal with their aging a little more easily. I feel very lucky in that my parents lived to be 86 and my aunt is 92! My grandmothers lived to be 92 or there abouts too. If my brain lasts better than theirs I will be happy!! So true. It’s a pity our culture does not honor aging. Happy Birthday! Thank you so much, Halfcupful. I declare myself birthday queen for the month of August, after all, why not celebrate as long as I want to!! One never knows how many more they will have so every one should be celebrated for a year! Just kidding,there would be too many birthday queens and kings for a year running around getting in trouble. So perhaps that is why there is only one day to celebrate our birthday! But maybe I can be birthday queen for a week. LOL. Thank you so kindly for commenting and wishing me happy birthday!! Hugs!! Oh, definitely go ahead and make it a birthyear! You deserve it! Aww. Thank you!! I might just continue every year after. I love life. You are very kind. Have a wonderful month, heck have a wonderful life! Hugs! extremely well done post. your words and thoughts just flowed, inter-connecting beautifully. 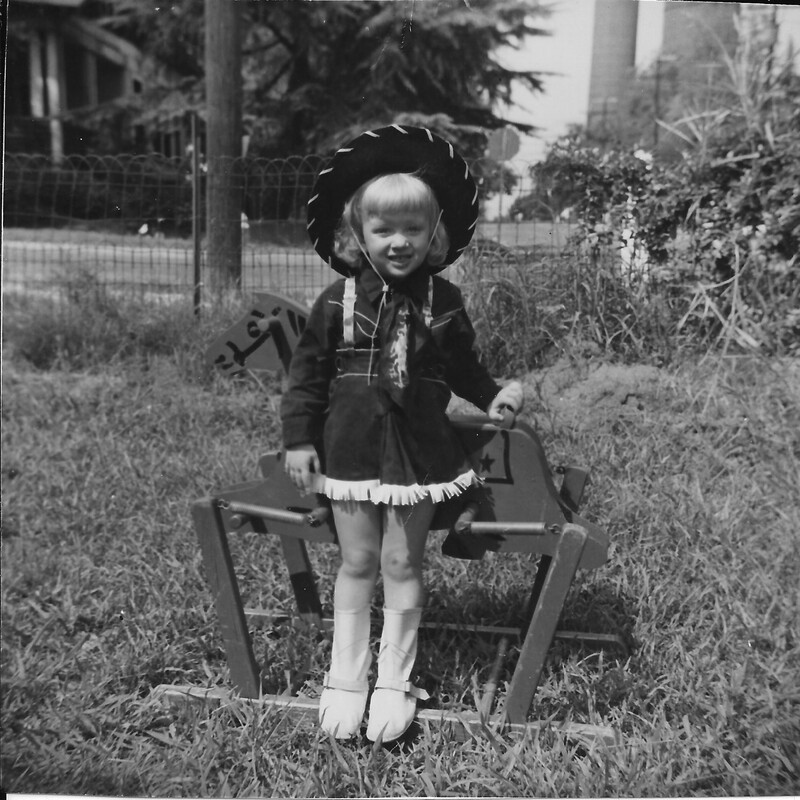 And I loved the cowgirl outfit in the picture. Somewhere I have a picture of me in the same outfit sitting on a pony. And I equally remember those old tv westerns. You are so right in the things they taught us. 1 hour morality plays designed for kids. Wish they were still televised. Kids need to learn those lessons. Thank you, Suze! That is some high praise!! I really appreciate it! Kids have no concept of cowboys, Native Americans, formerly known as Indians because some discoverer thought they had a landed in India, and settlers and colonies. Now adays perhaps these ideas and lessons could be taught by colonization of a planet with humanoid beings that we could interact from hopefully more appropriately! LOL! I loved those cowpokes. their horses, and the women who loved them and who they had to rescue, except for Barbara Stanwick!! Wow!! Nobody crossed her! Anyhow, thank you again!!! Thank you!! It means a lot to me since I am turning 65 this month. Thank you, Mother Wintermoon. Delighted you are reading them. Hope you are well.Hugs. Lovely thoughts on aging. And Happy Birthday to you, Elaine. My husband is a huge fan of Westerns. I’ve learned more about Westerns being married to him than I knew before. I didn’t even know the Rawhide song…somebody teased me about that once. These shows often had more depth than a lot of the TV shows today. I totally agree, Kate. For the 1940’s-early 60’s, Westerns were a great medium for teaching strength, courage, family values, morals, and so much more. That is one of the sweetest things anyone ever said about me. Thank you, sweet lady!! I enjoy the old westerns myself and am always amazed when I see any of those actors in current ‘real time.’ Course I am also surprised by the old weathered crone that reflects back in the mirror now too. Just a lovely post about aging. Thank you. Thank you!! I always encourages me to keep writing when people say such lovely things about my efforts. Hugs!! Absolutely agree. I think I am lucky to be getting older and older. Some have not been so lucky. You sound like person with a young attitude. I think that makes a lot of difference in how the aging process affects us and our attitude. My inner child is fed daily and more often. Lol.